Ever Wondered What Goes on Behind the Scenes? A comment that I hear from time to time is ‘You’re nice and quiet in here so you can relax’. It’s a lovely thought and I would love nothing more than to sit at the desk and stare at the side of the church opposite all day (or I could watch some paint dry very easily as I have the resources at my fingertips). The truth is that we’re always busy here at Crafty Monkey. This time of year, believe it or not, is officially Christmas! Towards the end of September, we have many mums booked in to get their babies’ hand and footprints onto baubles (we love their organisation!) and mums’ group bookings become especially popular. By the end of October, we book our customers in back to back so that we can keep up with demand. We can eat lunch and have a wee in January- until then, we become super-human! So, what goes on behind the scenes? Lots. The most obvious thing is the production line. More than half of our customers will ask us to decorate their pieces for them. This means that every day, I have piles of stuff that need some love. Last year, I painted close to a million (give or take) antlers and red noses on footprint reindeers and I have written ‘Happy Christmas’ more times than Santa’s Elves have. Our kiln is on most days during this period. Loading and unloading is something of a mammoth task and can take a couple of hours each way. It’s a top loading machine, meaning that we use heavy shelves and posts and it’s a bit of a balancing act…not for the faint hearted to say the least! We then need to gather people’s orders together and organise them for collection. This is more difficult than it sounds as we have so much stuff constantly rolling in and it can get very hectic. We also struggle for space during Christmas as we are heaving with pottery and can’t fit it all into our usually ample window display space. Other than that, we are packaging things up to post, dealing with the creation of imprints/outprints, painting commission pieces, receiving mail to be dealt with, ordering stock and battling with huge pallets when it gets delivered, keeping the shelves plentiful, answering the phone as it rings off the hook and attempting some form of tidiness in the studio. And the most time consuming and arduous task of all? Filling the little paint bottles up on the tables. If somebody could invent self-replenishing paint bottles, I’d be all over it! That’s a brief synopsis of what goes on behind the scenes…there’s actually a lot more happening but I’d be here all day if I listed it all! How are the summer holidays going for you so far? Personally, we’ve been having a great time! It’s been a busy one so far and our diary is looking a lot like the fun isn’t going to die down anytime soon. We’ve seen many familiar faces over the past few weeks and some of our local younger visitors have been coming to see us on a weekly basis! We must be doing something right! However, this year, we’ve seen a big increase in children from far and wide as they’ve been brought along by aunts, uncles, grandparents and family friends as part of their visit to St Neots. From Norwich to New Zealand, we’ve made lots of new little friends! Some of these children look forward to collecting their painted pottery next time they see their loved ones, but many of them have been making things that they can take away on the same day. Our Build a Bear range is ideal for little travellers as they can make a little companion to pop into their suitcases and snuggle up with at night times…they can even have their own changes of clothes if desired! Alternatively, our squishy, shiny putty – Foam Clay is another mobile option as the pieces will touch dry quite quickly meaning that the children can create until their hearts’ content and and take their items with them to admire forevermore. If you’d like to bring a visitor along to create a memory, give us a call on 01480219222…and remember, pottery painting isn’t just for kids! Grown-ups love it too! It’s probably a little known date in the calendar, but yes, today is indeed Superman Day! At Crafty Monkey, we are fortunate enough to have had a visit from the great man himself as he dropped by to try his hand at a spot of pottery painting. So, what did he choose to paint? Was it a bird? Was it a plane? Not exactly, he chose a gnome..we can only assume that Superman is partial to a spot of gardening when he’s not busy being a hero! We’ve all seen the endless blogs, articles and videos on ‘make-overs’, but we’re used to seeing lackluster hair transformed into luscious locks and pale pallors brightened to supermodel standards. But did you know that at Crafty Monkey, we’re the master of make-overs? This poor old mug was feeling properly dowdy and under-dressed. Our idea was to turn it into a unicorn mug. I think you can see for yourself how happy the mug was with the results! Usually, the client expects somebody to do their make-overs for them…not at Crafty Monkey! If you come here, we encourage you to do your own make-overs! One of our customers carefully applied this owl’s make up and now look at him! ‘I want to look like a princess riding a unicorn’, she said. ‘No problem’, we replied. She was merely a shadow of a thing- now look at her transformation! If you’d like to visit us at Crafty Monkey and learn how to perform make-overs yourself, we’ll show you how, it’s easy! Call us on 01480219222 to book…see you soon! Either by phone or in person, we’re used to being asked a range of questions by customers or passers by. Some aren’t sure that they’ve got what it takes to come in and create and others don’t know what we do in here at all! Below are a range of questions and answers to help you figure out what it’s all about! I’ve got no artistic talent, can I come and paint? Yes of course! We will guide you through and be on hand to assist you. You don’t need artistic talent as we have plenty of pieces (such as ornaments) that simply need the colour adding to them and it’s really easy! My child is only a year old, is she too young to paint? As long as your child can sit up and hold a brush- she can paint! It doesn’t matter what the end result is- it’s their very own artwork and you can cherish it forever! If your child is a small baby, come in and make something with their hand and footprints on! We also do other keepsakes to capture your child’s prints, such as Silverprint jewellery and imprints and outprints. 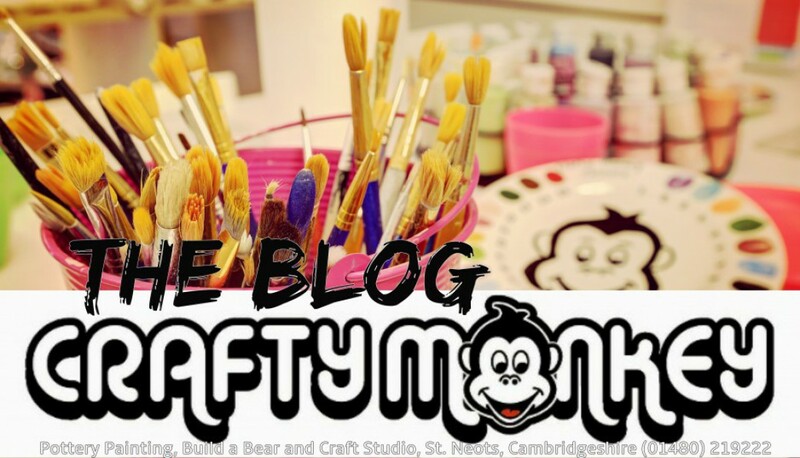 What other activities are available at Crafty Monkey? There’s plenty of fun to be had here! You can build your own bear, have fun with Foam Clay or create with decoupage. We also run workshops from time to time (keep an eye on our facebook page for details). Adults evenings are on Thursday, by appointment. We don’t. This is because we have hundreds of different pieces of pottery and they are all priced individually. We often have new ranges of stock too. Everything has its own price and our studio fee is just £4, so it’s easy to come and browse and work out how much you’ll be spending. As a guide price, our average sized mugs start from £11. Do I need to book an appointment to come in? We always prefer it if you book. From October to December, booking is essential as it’s incredibly busy. The same goes for Mother’s Day and Father’s Day and school holidays. If you’re coming as a group, always ring and check that we have space for you. How long will it take for my pottery to be ready for collection? Your pottery will be ready a week after the day you finish it. If you’re in a rush to get it back, we may be able to get it ready within three days for an extra fee of £3. Can I do something to take away the same day? Yes, you can do foam clay, build a bear or decoupage and take your creations home the same day! It’s also possible to paint ornaments in acrylic paint (not recommended for young children). I need a special gift for somebody- can I get a commission piece made? Yes, give us a call or come and see us and show us your ideas so that we can give you a quote. Alternatively, you can order a gift from our website where you’ll find a range of designs to choose from. Is my baby too young to have handprints done? No. We know that some studios have age restrictions, but we don’t! Our youngest customer was three days old…if you can beat that, we’d be happy to accommodate! My baby won’t open his hand, does that mean I can’t have a print? No, we have ways and means! Yes we have hot and cold drinks and a range of small snacks. Yes, our bathroom is equipped with a changing station and mat. Can I have a party at Crafty Monkey? Yes, we’re party experts! We have a range of party packages for all eventualities- from kiddie’s birthdays to team building outings. Contact us or check our website for more info. I am astonished that you managed to get my baby’s handprint. Are you magic? Do you sell knitting needles/gold plated buttons/fishing equipment/wallpaper? Do other babies make this much noise? Yes. We are immune to it, don’t worry!